Personality: Blue Streak is above all else, a heroic, and brave individual who only wants help others. Blue Streak is someone that you can always count on when you need them the most. He’s a brave, trustworthy individual who would never backstab a friend, even if it meant the cost of his life. While he is a natural helper, he can be spotted in a distant mood sometimes, going so far from Nuira that it takes several seconds at times to snap him back. At other times he’s a clown, the spy of hatchlings, a mischievous fluffy dragon that never seems to run out of energy. He might just wear out his mate and still be full of energy. He is essentially, a giant hatchling. TL;DR Protective, Brave, Helpful, undyingly loyal. Wandering/Exploring: Curiosity is Blue's bread and butter, and sometimes spike. From a small hatching, Blue has always been curious about the world and its functions, sometimes, he spends more time outside his home than inside. Searching for relics/artifacts: The pursuit of lost curios constantly lingers within Blue's mind, whether he comes back with one, or a bag full of dust, is up to the locations he visits. Collecting Herbs: It seems that the reminder of injury is always on Blue Streak's mind, which compels him to collect an extra amount of herbs on his travels, those that over-fill his satchels go straight to the healers of the Twilight Palace. Having his fur or feathers pulled. Injuring his, or tattering his wings. Failing to save or protect someone. Language: Fluent Universal, Kishin, Valeterrene. Decent Xoyan, Vuari. Born in the hatchery in a singular clutch beside his parents, Blue Streak grew up to be a rather streamlined figure, and proved to be extraordinary in flight, beating most if not all of his hatchling friends during aerial races. Unfortunately, he gained only a few friends in his youth, and even so, has had a collection, or rather a few decent friends to call his own. Much of the time he would fly alone, lapping around the Palace in thought, when that didn’t satisfy him, he became a Messenger and Guardian of his tribe, running the occasion errand to rid his mind of idleness, and patrolling to his own whim outside the Tempest Ring. On a fateful errand to the Vuari, Blue Streak became lost in Gaiyan forest, where he met an exceptionally lonely and depressed dragon named Savan. He soon warmed to the slightly older male, becoming close friends by the time he had to leave. With his time in Gaiyan Forest with Savan, he had learned to scout herbs and even hunt to a more capable degree when larger prey was scarce. Blue Streak also has a unique avian called an Aerrak, named Striker. Both have a deep telepathic connection to one another, and the avian itself is capable of speech, though only a few souls actually know about this. Striker’s egg was found by Blue Streak’s parents, abandoned just outside the Tempest Ring, and when the time came to lay the egg of Blue, tucked the smaller egg beside the other, where they then hatched nearly at the same time together weeks later. His species is notably rare to the point of it being lucky to find one at all. Though carnivorous, they have been known to feed on specific fruits found only on the desert continent. Scale/Fur/Feathers: Fur with feathered wings and tail. Armor: Wears leg armor and tail armor when doing his tasks. Heat Retention: Blue is able to draw in a lot of heat into his body at will, allowing him to travel in frigid locations for an extended amount of time. he can also act like a radiator to other dragons in need, giving them a substantial amount of warmth. Blue can draw heat from his surroundings, but not in the way of draining it to a frigid environment, and considering dragons, will simply draw in excess warmth from their bodies. The process and speed of which this occurs is dependant on the ambient temperature and location. 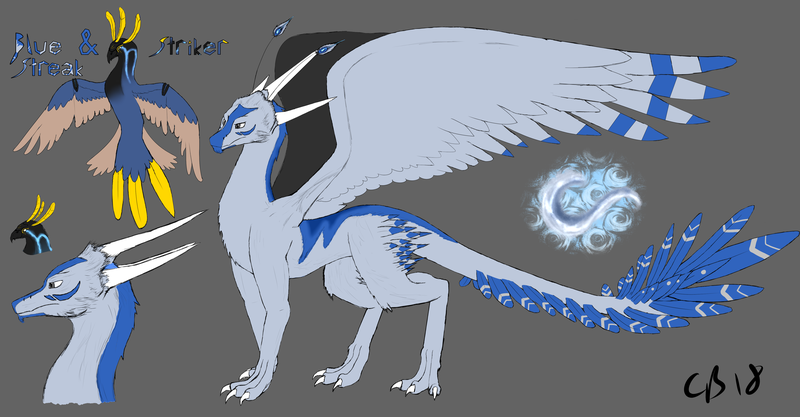 The primary reason why this is so effective for Blue is due to thermal transference of the air around him, and can generally utilize it to draw more from specific areas, such as fires, or simply a warm, furred dragon. Wind Element Summary: If there was one word to describe Bluestreak’s skill of Wind: Tuned. Blue’s wind abilities primarily centered around utility, but is able to be used offensively and defensively to suit his needs. Blue Streak can naturally recover slightly faster from using his Wind Element. Wind Breath: Blue’s wind breath allows him to manipulate objects from afar, while also dragging enemies that are light/small (Heights of around 60 ft) enough across the battlefield. Blue will fatigue after roughly (5) posts if used consecutively. Range of (100ft). Dragon's caught in Blue's breath can resist by fighting against it steadily, size and weight also play a factor in judging how strong his breath can be. While a large imposing dragon can stand firm without truly risking being felled, but a small can clutch onto surfaces and wait it out that way. Dragons in flight however are much more affected by this and are much more easily manipulated. Tornado: Blue spins at blinding speed in a vertical position while moving horizontally, causing those struck by his body to be violently repelled and thrown away. Debris and other materia is also thrown towards his enemies at deadly speeds. Due to the amount of concentration required to use this technique, Blue can only stay in relative rate of about (5) posts per burst, but can stop if chosen, leaving him less exhausted, or simply over exert himself to keep it going, to detrimental effect. This skill can be sized to conform to his body, making it less tiring to use, or enlarge it to affect a larger area, fatiguing him much quicker at the cost of strength. Insanely Mobile: Blue is among the quickest when flying, and is able to keep up, or simply pass by others with little effort. He can generally fly faster due to his bodily structure, and could reach the limits of flight if he wished. Strong body: Blue Streak’s body is tempered for prolonged extraneous activities, allowing him to go longer than other dragons. Lightweight: In order to attain high velocity and quick on-point agility, Blue Streak is very light, which can also be a double-edged blade if he’s not careful in certain situations. Fire weakness: While Blue Streak’s feathers and fur can withstand heat, they aren’t able to withstand prolonged exposure to flames, and will ignite soon after. Low armor: Blue may have a lot of vitality to him, but without scales, there is very little in the way to keep anything sharp or otherwise dangerous out of his body. Lightweight: Because of his lightweight body, Blue can be sent flying by powerful attacks or prone to getting pinned by heavier dragons if he isn’t cautious enough. Wing Pride: Should Blue Streak’s wings ever be incapable of flight for the long run (Broken, damaged), he will undoubtedly be put in a depressive mood/low morale. Aerial Master: Blue Streak can literally dance around his opponents when in the skies, and takes great caution and strategy when it comes to outlasting those stronger than him. Wind Manipulation: Blue Streak seems to have a deep understanding and affinity of Wind, and is able to finely meld it around him with ease. From simply throwing a harsh gust at an annoying Striker, to finely filtering the oxygen molecules to extract it into a bubble either around him or another. His range of manipulation is roughly around (150ft). Wind Spear: Blue envelopes himself in his wind magic, tucking in his wings, before charging a short distance at the max speed to attack, before coming back to his original speed. The impact jostles him a little, but otherwise leaves him unscathed. Wind Shield: Deflects projectiles of both magic and physical means. Doesn’t affect actual physical or magical melee attacks. Wind Boost: Blue is able to fly up to the maximum aerial speed limit for a limited time. Deflection: Blue Streak isolates the chosen projectile shot at him near the tip of his tail in a powerful magical field, curving it around in a front/back flip to fire it back at the enemy. The larger, more potent the projectile, the slower he revolves the projectile back. Can only nullify one projectile per post. Doing this consecutively for too long will eventually fatigue Blue.